This summer we were chatting about our favourite digital tools on Twitter and sharing some tools we would like to explore this upcoming year. It seemed like the perfect topic for our first #peel21st blog hop. So here we are! 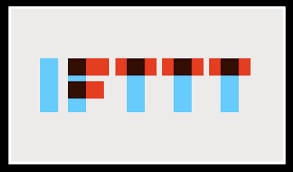 Read on to learn more about IFTTT and don't forget to check out the other blog posts linked at the bottom of the post. One of the amazing things about 21st century technology and the tools that accompany it, are the vast amount of resources available. The growing sentiment made by many is ‘There’s an app for that!’. All these apps can make life a little more manageable, while at the same time a little more confusing. The endless apps that are released, then downloaded to your device, can make managing them all extremely overwhelming. Here’s where I believe the app IFTTT can really help! It’s not something I’ve used exhaustively yet, but begin to see some really useful potential. Imagine the student who is looking to manage their work from their courses, or the emails they receive, or a list of due dates from their teacher. What do they do with all this information? IFTTT looks to show them how to leverage the power of one app, to support the other. IFTTT is really a digital tool recipe maker. It allows users to leverage the apps or web tools they use on their devices, by illustrating the various ways you can use them with other tools. It allows users to create their own recipes, or by browsing the hundreds of recipes already created by others. These recipes illustrate the idea that ‘If you use this app/web tool, then you should use this other app/web tool’ with it. IFTTT breaks down the recipe into manageable parts, and gives users the ability to select suggestions on how to best leverage each through their recipe creation process. Users have posted an endless supply of suggestions and it’s quite amazing to see the creativity - how about using the weather app in conjunction with the phone call channel app to give you a wakeup call every day! With the weather report! As you can see, I'm only beginning to explore its potential, but begin to see how it can make my life a little easier, and hopefully students' as well. If you have a really useful recipe, please share it; the creativity of its users is really what makes IFTTT so amazing! Don’t forget to check out the other blog posts in our Blog Hop! IFTTT is a great tool and, like you, have only started to unlock the potential of this tool for personal use. One of the recipes I use is to save any tweet that I favourite into my Evernote account. This is a quick way for me to grab a great link or a meaningful tweet even when I'm on the go. I think that as students become increasingly invested in their online accounts, this tool will really help them to simplify their work tasks. You are way ahead of me Graham! I just read Jason's post and thought it would work well with Greg Pearson's Pocket app and here you are already using it to post your favourited Tweets to Evernote. Thanks for this post, Jason! Someone showed me this app last year and I forgot about it until I read your post tonight. I am going to check it out for sure. I haven't used it at all yet but it would appear that I can use it to automate workflows involving various apps on my iOS device. If that's true, then this is going to be a mind-blowing app... Thanks again for sharing!